San Diego County’s most unique vacation and luxury wine tourism destinations. 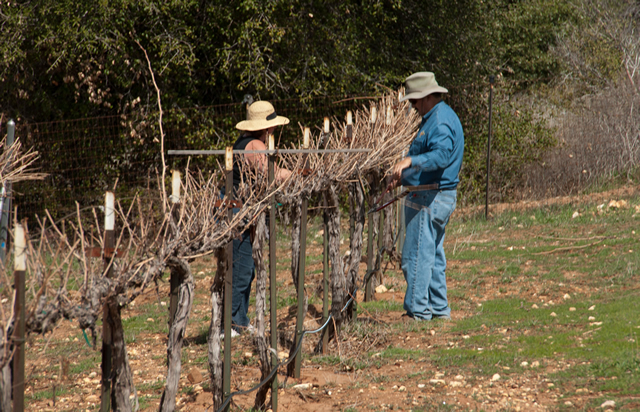 Eagles Nest Winery is family owned and operated by Dennis and Julie Grimes. The winery and a portion of our vineyards are located on our gated country estate overlooking the west Ramona Valley. As a testament to the excellent growing conditions of our area, the Eagles Nest property previously hosted an apple orchard (a few stalwart trees remain) and some older grape vines. Later, we extensively planted our family and leased properties with more Vitis vinifera (European grape varietals) to further enable our winemaking. We have great respect for education, hard work, and practical experience. We have studied winemaking and viniculture with world renowned University of California, Davis. We are both technology professionals and veterans, Dennis is a U.S. Naval Academy (Annapolis) graduate and he retired from a career in Naval Aviation (P-3 Orion aircraft) and Julie served with the U.S. Army. In parallel lives, Julie is a highly regarded Computer Science professor at local college, where she earned national design awards, teachs e-Commerce and Internet design. She has a reputation for consistently discovering and mastering the latest web and Internet technologies and pioneering use of that material in her coursework. Dennis is a senior program manager and Systems Engineer with the Federal government, and a former, now part-time college IT/Business professor. Many of the college science faculty are close personal friends who enjoy assisting at the Winery during their off hours. We invite you to experience our wines, the full winemaking experience, and the serene beauty of our private estate including the Winery, vineyards, and stunningly beautiful vacation accommodations – all sharing unsurpassed views of the West Ramona Valley. Rest assured, there is truly nothing quite like Eagles Nest (please see Guest Comments under Guests tab above). Our red wine varietals include Cabernet Sauvignon, Zinfandel, Merlot, Tempranillo, the Rhone staple Syrah/Shriaz, and others. Our white varietals include the popular Rhone varietal Viognier, and we are experimenting with Picpoul Blanc and others. We are continually researching quality varietals that compliment the Ramona Valley for future vineyards and meet our customer’s needs. Community Giving – Enjoy our custom artwork labels featuring community service organizations. Eagles Nest takes great satisfaction in the opportunity to support community service, charitable, and industry organizations. We donate, or have donated our personal time, services, product, and facilities to these worthy organizations that benefit and better our community and enrich lives. We want to personally acknowledge the unsurpassed dedication and generosity of Mr. Lum Eisenman in advocating quality winemaking in the region as the unofficial regional wine guru and one of the wine makers at Belle Marie Winery, Escondido, California, Lum’s legacy of fine wine will forever benefit wine lovers. Ciao! – Welcome to Eagles Nest Winery!